I have been busy making things all week but I couldn’t get any decent photos as it’s been so dull and dark, so those are for later. 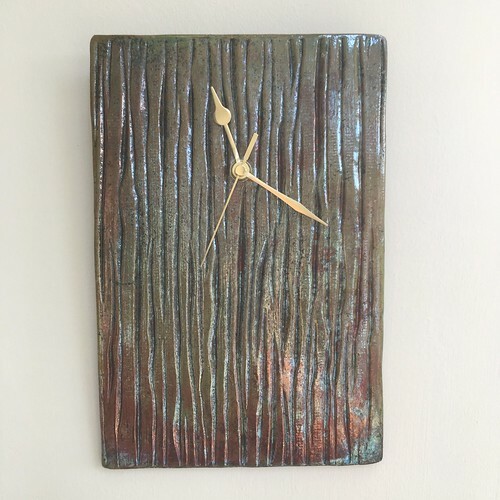 I can show you my raku clocks that are now adorning my walls, I thought they should be tested for a while before I go into production. 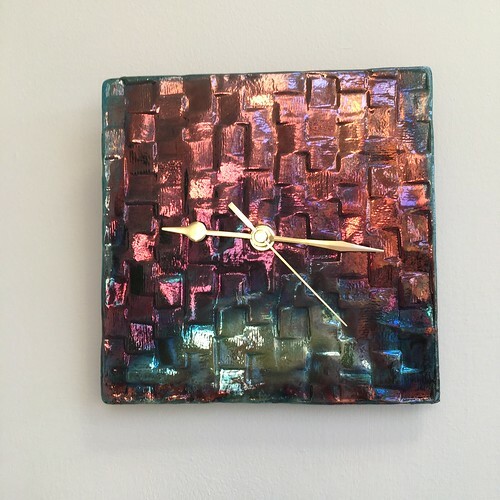 I made this one with the intention of keeping it as I need a clock in the lounge, the shape echoes a metal and glass lamp. This clock has some copper in the texture and at the bottom where the flame licked the surface. I didn’t intend keeping this one but when I hung it on the wall in the front room it looked perfect, it’s the room where my raku leaves live. I think you might agree that the colours are perfect and the play of light on the texture looks great. There was a round one but as is the nature of raku it looked like something a cow had deposited so it went in the bin. I hope to have some clocks in my shop next year. Sounds strange saying that, where has this year gone? This entry was posted in ceramics, Clocke, kiln fired art, raku and tagged kiln fired art, raku ceramics, Raku clocke. Bookmark the permalink.